My experiences with self-published works vary from good to bad to ugly. Luckily, this is one of the "good." I downloaded it to my Nook on a whim, read it during a crazy reading mood, and was pleased to find a good old fashioned fantasy adventure with danger, magic and killer cat people. I want more information on the world and the magic system, but I'm pretty happy with the little I've seen. The characters grew on me. 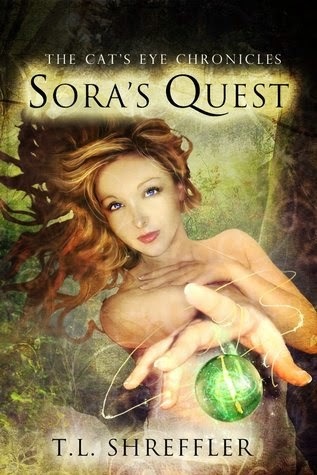 Sora isn't one of my all-time favorite heroines, but she matures from a spoiled noble to a toughened trekker. A few sparring sessions does not a warrior make, but she's learning to take responsibility for herself and others and to work hard and purposely rush into danger. :) And the three traveling companions, while I would have liked to know them better, are decent. Of course, we are reading from Sora's perspective (in third person ^^), so we are limited by her thoughts and observations; but still, a cool little company. There is no romance, but there are hints that it may develop (very, very slowly) somewhere down the line. The world is populated by humans and...others. The (nearly extinct) different races are a little...eh, almost stereotypical or cliched? Cat people, "Wolfies," some other to-be-named stuff, but at least they weren't all just humans with pointy ears. (Looking at you, Star Trek.) And the different types of magic they use are kind of cool. I want more details on the Cat's Eye magic (and other magic) and how it works. Volcrian, the main bad guy, was more creepy than scary to me. The blood sacrifices/magic and everything- creepy, yes, but I had a hard time believing our fierce band of warriors was running from him. Then again, he does have a tendency to conjure magical creatures that are near impossible to kill and bent on destroying the (anti)heroes. Australia?! O.O TAKE ME WITH YOU!!! Can't beat that :) Glad this one worked out for you. Also happy to hear that what romance there was is a slow build. I miss that. It's a very good thing there was little to no romance. She may have "asked" to be kidnapped, but she was still technically kidnapped, so any romance would have fallen into Stockholm Syndrome territory, which almost never works for me.